The menu this week is one of my very favorites! It's filled with delicious, healthy, soul-satisfying dishes. The shrimp and goat cheese quesadillas and the lightened-up chili dogs are quick meals that can be prepared in under 10 minutes, while the pot pie is best made on a Sunday afternoon and enjoyed as leftovers all week! If your local farmer's market is open for the season, shop there for your produce and save money. Spring is coming! This is a light (and delicious) version of the ballpark classic. Wrap buns in foil and warm in the oven. Boil a pot of water and simmer hot dogs until they float. Heat chili. Top each hot dog with chili and a sprinkle of cheddar cheese. 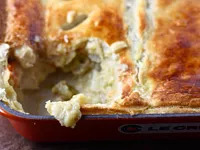 Everybody's favorite comfort food—simplified with a puff pastry crust! Preheat oven to 425° and take puff pastry sheets out of the freezer to defrost. In a large pot, bring stock to a boil and add carrots, celery, and potatoes. Simmer for about 15 minutes, or until veggies are tender. Remove veggies with a slotted spoon and pour stock in a large measuring cup or bowl to save for later. Fill pot with fresh waster and bring to a boil. Add chicken breasts and let simmer for about 20 minutes, or until cooked through. Drain and let chicken cool before cutting into cubes. Set aside. Melt butter in a Dutch oven. Add onion and cook for 6 minutes, stirring occasionally. Add flour and stir constantly to make a roux. Cook for another 5 minutes, or until the roux begins to smell toasty and darkens in color a little bit. Slowly stream in reserved stock while stirring to make the sauce (it will get thick!). Cook and stir for another 3 minutes, then turn off heat and slowly pour in the cream. Add the cooked veggies and chicken back to the sauce and mix in salt and pepper. Pour pot pie filling into a large casserole dish that holds at least 2 quarts. Unfold defrosted puff pastry sheets and gently lay over the top. Brush top with a beaten egg for shine. Cut small slices in the pie to let steam escape, and then bake for 10 minutes. Cover with foil and bake for 25 more. This quick and easy meal does not skimp on taste! Heat bell pepper and onion mix in a skillet over high heat for about a minute. Transfer to a small bowl and set aside. Spray the same skillet with cooking spray and crank up the heat to high. Add shrimp and cook for about 30 seconds. Mix in the cayenne pepper, salt, and chili powder, and toss to coat. Immediately take off heat (shrimp cook fast!). Scatter pepper jack cheese and goat cheese on two tortillas, and then top each with four cooked shrimp and a little bit of the onion and pepper mix. 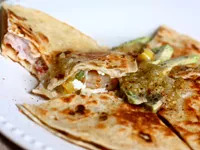 Lay other tortillas on top and cook each in a greased skillet over medium heat until the cheese has melted and the tortillas are golden brown and crispy. Let cool and then cut into four wedges with scissors. Serve with avocado slices and salsa.